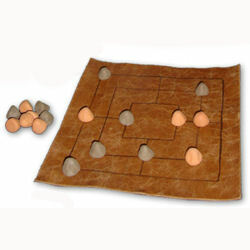 Played by princes & peasants for 3,000 years, Morris is simple enough for children, yet the strategies can interest adults. The object is to form "mills"(3-in-a-row). When a you make a mill, you can steal an opponent's piece. You win by reducing the opponent to just 2 men.